Heesen 42M motor yacht ALIVE has been delivered in 2014 and is now priced for sale. Designed by Omega Architects luxury yacht ALIVE was built in steel with aluminium superstructure. Thanks to huge advancement in performance this superyacht achieved 35% more efficiency compared to other yachts of her size. To name only a few technical features ALIVE yacht comes with the undewater foil called Hull Vane, sub-sea wing harnesses waves producing power in combination with a fast displacement hull. Put simply the result is that Heesen ALIVE yacht for sale produces lift whilst moving through the sea like an aircraft produces lift flying through the sky. ALIVE was also the first Heesen yacht to be fitted with both innovations Hull Vane and FDHF Fast Displacement Hull Form. 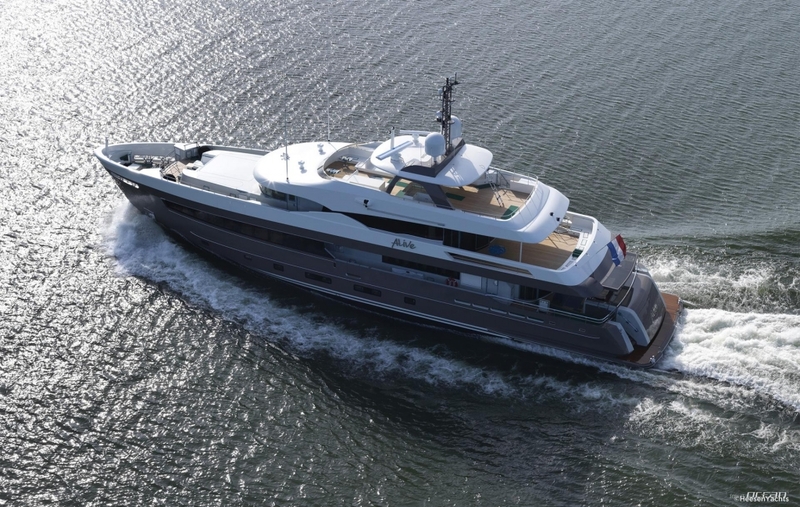 Superyacht ALIVE accommodates 12 guests in 6 luxurious cabins comprising two large suites, one on the main deck forward and the other on the wheelhouse deck. The latter is a spectacular circular room with a centrally located king size bed, ensuite bathroom, dressing room and gym. The central positioning of the bed allows stunning, uninterrupted panoramic views of the sea thanks to huge floor-to-ceiling almost seamless glass windows. The 30 square meter aft terrace is equipped with a big table and lounge seats completing the functionality of the owner’s deck. ALIVE's lower deck cabins are two double and two twin cabins all equipped with audio-visual entertainment systems and en-suite bathrooms. Heesen ALIVE yacht for sale has a range of 5.000 nautical miles at 10 knots in eco cruising mode and her power is provided by 1.447 MTU diesel engines. The cruising speed is indicated with 14 knots respectively 16 knots top speed. Comfort on board of Heesen ALIVE 42m is ensured by latest Naiad zero-speed stabilizer systems. Heesen ALIVE luxury motor yacht is asking 18.500.000 EUR.